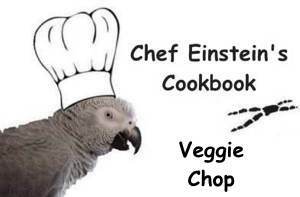 I started making Veggie Parrot Chop after reading a blog post from Parrot Nation. I must give credit to Patricia Sund for this wonderful idea! It has been a real time saver and is so nutritious! Just like mash, I’m sure there are several variations. Each time I make it, it is always different because I’m always adding different vegetables. Here are the basics of what I do. Before we start... Jeff gives me a ride in the "Chop" bowl! Weeeee! This list of Veggies is just a guide. Use creativity and buy what looks good and what is in season. Wash all vegetables very well and dry very well. (I use a salad spinner) It is important to have the vegetables as dry as possible. Combine 1 cup Quinoa and 1/2 cup Amaranth in a 9 X 13 pan. Pour 3 cups boiling water, cover tightly with aluminum foil. Bake in a 375 degree oven for 30 minutes. 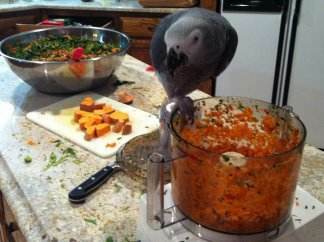 Chop all vegetables in food processor, and place them in a large container. 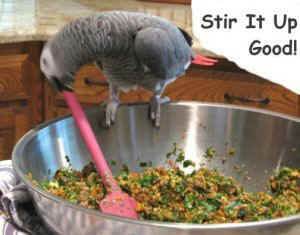 I use a 16” stainless steel bowl, but any large contain will do. Mix them up as you go along. Add the cooled Grain Pilaf and the Quinoa / Amaranth to the Veggie Chop. 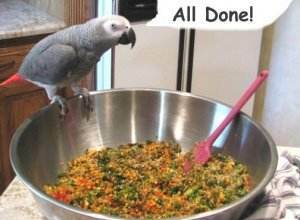 Add 1-2 handful uncooked veggie alphabet pasta and/or 5 Grain rolled Hot Cereal (Bob's Red Mill) This will soak up any liquid in the Veggie Chop. 2-3 Tbls. (or more) cracked red pepper flakes. 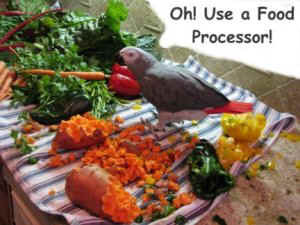 You may also add what ever else you think your birdie might like for variety. Here are some suggestions: chopped nuts (almonds, pecan, cashew, etc.) pumpkin seed, pine seed, hemp seed, etc. Pour the solution in to a clean spray bottle. Spritz on fresh produce generously. Allow solution to sit on produce for 5 minutes then rinse the produce well.